2. TORSTEIN DALE SJOTVEIT =New Head of Sarawak Energy Berhad Group-Hornbill Unleashed writer said,”As a Sarawakian, my view is: surely we can find a local CEO capable of running the show, especially in this area where energy capabilities are jealously guarded as national secrets. Its not about being calling names of Kwai Loh but the salary bracket in which there are/must be capable Sarawakians or even Malaysian able to fill the posts. No wonder the Brains of the country are all being utilised by other countries. Their own country look down on them and only a Foreigner can do the Job. The in-built attitude is already cancerous,” THE KWAI LOH WILL PERFORM BETTER THAN A LOCAL..” Oh…Please..” Next we will have voices whispering to us ,”Give him a chance…Too Familiar right………. This goes back to PKR and judging from Baharuddin Mohksens statement he really is pleading and going down on his knees to Sarawakians on giving PKR/Pakatan a chance and to ensure that they are responsible and capable of administering the state. Politicians always say that before they come to power. Don’t get me wrong she said but I believe that Pakatan or BN has to change their ways of picking the Peoples Representative -MPs or YBs. Having tons of degree/papers doesnt make someone a good politician but someone who will see to the needs of the constituents and has the right mental political attitude. The person must be well groomed and the criteria has to be vetted in so much that those with extra baggages/outlived their usages must be dropped or replaced for the better good of their respective parties. Go down to the ground and check up carefully with the villages/headman/tua kampung and get the right signals from the people who matter mosts. So, PKR will you employ a Foreigner to fill the shoes in which a Sarawakian/Malaysian can do at half the price..?? Whats REAL than…?? Joey’s brother in law forwarded an sms and asked her to refer to busineess week com and also reposts in audie61 . It does spell unhealthy but not yet all gloom and doom for Malaysia’s economy.The CEO and Prime Minister Najib is trying to woo foreign investors into the country but it seems these negative media reports are definedly hurting Malaysia’s image as a a safe investment. Jan. 11 (Bloomberg) — Malaysia sought to contain attacks on Christian churches and allay international concerns amid fears the violence could polarize the country’s multiracial society and deter overseas investors. Police are investigating at least 10 acts of violence in the past four days, including several arson attacks, all believed to be prompted by a Dec. 31 court ruling allowing a Catholic newspaper to use the Arabic word “Allah” to refer to God in its Malay-language section. Malaysia has been largely free of the violence by Islamist groups that has fuelled insurgencies in the Philippines and Thailand, and attacks on Western targets in Indonesia. Some fear stability may be threatened by the politicization of religion as political parties vie for the votes of majority Muslim Malays. This morning, scorch marks were found on the main entrance door of the Sidang Injil Borneo church in Seremban, Negri Sembilan stake, the Star reported today, citing police. No arrests have yet been made, Deputy Inspector-General of Police Ismail Omar said. The weekend incidents follow three attacks and one threat on Jan. 8, when the office of a Pentecostal church in Kuala Lumpur was torched. “These outrageous incidents are acts of extremism and designed to weaken our diverse communities’ shared commitment to strengthen racial unity,” Home Ministry Secretary General Mahmood Adam told reporters after briefing foreign diplomats in Putrajaya, near Kuala Lumpur. Though the Kuala Lumpur Composite Index shrugged off the news, rising as much as 0.3 percent, the attacks are bound to color foreign perceptions of Malaysia, said Stephen Hagger, managing director of Equities for Credit Suisse Group AG in the capital. “This is not helping Malaysia’s efforts to attract long-term investments,” he said. Government officials expressed concerns tourists may stay away if the violence continues. “Tourists will choose not to visit a country faced with conflicts, especially religious conflicts,” Tourism Minister Ng Yen Yen was cited by the official Bernama news agency as saying. Malaysia’s High Court on Dec. 31 ruled that the Herald newspaper, a Catholic weekly, was correct in using “Allah” in its Malay-language section, as it is aimed at only Christians. Muslim protesters contend the word should be exclusive to Islam, and the government is appealing the decision. The Home Ministry banned non-Muslim publications from printing the word in 1986 on the grounds it could threaten national security and confuse Muslims, who comprise more than 60 percent of Malaysia’s 27 million people. The spread of more strident Islam across a swath of Southeast Asia is testing the ability of policymakers to appeal to devout Muslims while simultaneously protecting the rights of Buddhist, Christian and Hindu minorities. In July, a Malaysian woman, Kartika Sari Dewi Shukarno was sentenced in July to six strokes of a cane for drinking beer by a Shariah court in eastern Pahang state. While caning is used to punish at least 40 crimes in the country, this was a first for a religious offense. She is still awaiting punishment. Malaysia has a dual legal system. Shariah law covers Islamic affairs and deals broadly with issues of moral and religious issues applied to Muslims. It’s not only Christian churches that have been targeted by Muslims in Malaysia. In September six people were charged with sedition after trampling a cow’s head, which is considered sacred among Hindus, to protest the building of a Hindu temple. In October, Beyonce Knowles cancelled a concert in Kuala Lumpur after opposition to her immodest stage costumes voiced by Malaysia’s opposition Pan Malaysian Islamic Party, or PAS. Muslim and ethnic Malays leaders have criticized the attacks, saying they run contrary to the teachings of Islam. The word “Allah” was first introduced into Southeast Asia by Muslim traders around the 12th century, when locals didn’t have a word describing a single deity. The government’s ban applies only to print and not to non-Muslim rituals, meaning the word “Allah” is still used in Malay-language church services. Around 130 Muslim non-governmental organizations and volunteer policemen have come forward to help keep watch on Christian churches, Bernama reported yesterday. In Indonesia, Muslim organizations reminded followers not to make copycat attacks, the Jakarta Post reported yesterday. –With assistance from Barry Porter in Kuala Lumpur. Editors: Mark Williams, Ben Richardson. To contact the reporters responsible for this story: Manirajan Ramasamy in Kuala Lumpur at +60-3-2302-7858 or rmanirajan@bloomberg.net; Frederik Balfour in Hong Kong at +852-2977-6618 or fbalfour@bloomberg.net. To contact the editor responsible for this story: Chris Collins in Hong Kong at +852-2977-6475 or collinsc@bloomberg.net. 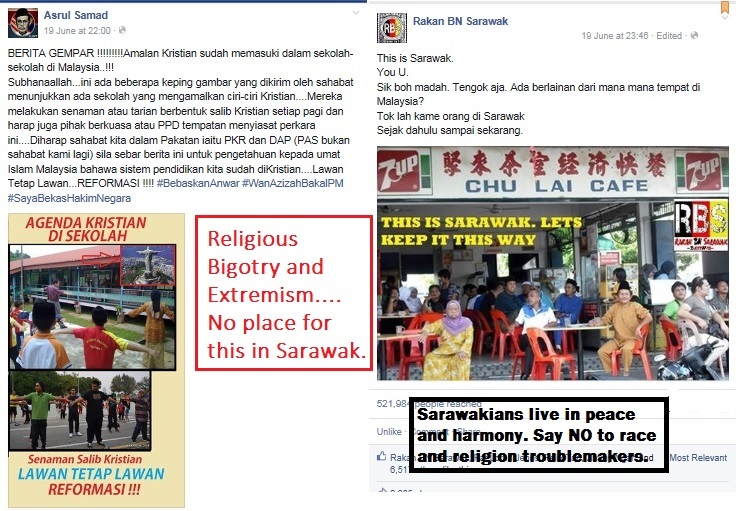 Imagine receiving an sms,”Sarawak mosque under attacked.Comment..? ?” Can you tell me how..? I was fuming mad and really aggitated and then cooled down and thought rationally with our audie61 crew. So here goes.. Think outside the Box..We have heard so many views from all religious scholars, political divides,Muslim and christian NGOs and it seems everyone is sensitive and only are putting their foot further in to aggravate the already fragile situation. To us in Sarawak after interviewing many Christians and Muslim Brothers and also after Nazri’s statement we thought O.K. a solution…. is at hand. However judging from this article in Malaysiakini and picking up the points it seems the tension has risen up to another notch. PAS vice-president Mahfuz Omar -He said that not only is there now two sets of rules, the minister should not be making pronouncements since the court process which sparked the controversy is still pending. Herald Editor Lawrence Andrew he said the matter is currently being dealt with in court and all parties should wait for the outcome and Nazri recent pronouncements may confuse the public. DAP veteran lawmaker Lim Kit Siang- criticised Nazri’s pronouncement because it showed that cabinet had already decided on the matter, while at the same time, calling for inter-faith dialogues to seek a solution. He adds that the ‘two rules’ for the use of the term ‘Allah’ makes a “total mockery” of the government’s 1Malaysia campaign. If the solution is to be found it is up to the editor to come up with a solution of PRINTING THE BAHASA MALAYSIA VERSION EXCLUSIVELY JUSTS FOR EAST MALAYSIA AND PRINTED IN SARAWAK OR SABAH. BETTER STILL FORGET ABOUT THE BAHASA MALAYSIA VERSION. WE IN SARAWAK AND SABAH KNOW HOW TO SPEAK AND READ ENGLISH AS WE WERE COLONISED BY THE BRITISH. DO WE NEED TO SAY MORE..????? WE in Sarawak do business alongside and eat together with our Muslim Brothers and we do not have religious, racial,skin,colour tensions. WE IN SARAWAK INTEND TO KEEP IT THAT WAY as I cant speak for my Sabah friends. Dont also tell me next that GOD will not forgive me as I have blaspheme or better still kick me out of the Catholic Church. DO NOT USE THE PEOPLE OF SARAWAK AND SABAH TO FIGHT FOR THE HERALD IN BAHASA MALAYSIA as an EXCUSE. A catholic parishioner said to audie61,”OMG…OH MY GOD…Seems that the church is also targetted like the church owes money to the Ah Long’s or its desecrated by them. Its not a LAUGHING MATTER ANYMORE MY FRIENDS..The message could be worse than that said another,”the culprits want to see blood spill in order to achieve their aims. The authorities needs to nab someone fast or else it will go on and its just like a “SERIAL KILLER” and many would copycat the actions. According to the report in Malaysiakini “ seven plastic bags filled with red paint were hurled at the church and it splattered on the back of the saint’s statue, flooring and fence. It was also reported in Chinese-language daily Sin Chew Daily that the police found two emptied paint cans in a nearby drain and in front of the church gate. This latest incident brings to 11 the recent attacks on places of worship, with 10 affecting churches. MALAYSIA IS NOW UNDER ATTACK AND THE WORLDS EYES ARE WATCHING IT VERY CLOSELY. ALL THE YEARS OF RELIGIOUS TOLERANCE WOULD GO DOWN THE DRAIN IF UNCHECKED<UNADDRESSED AND UN RESOLVED. Copycat bombings or whatever it is going to be called has got to STOP.NO EXCUSES WHATSOEVER…. Business in Malaysia will soon be affected as negative International news will filter through the mass media and the internet blogs. If its not bad enough even our very Malaysian blogs are asking many questions. Its obviously a very bad perception for multi-racial,multi-cultural and multi-faith Malaysia and the interantional tourists and businesses will find ways to bypass Malaysia as a favoured tourist destination or even as Regional Business Base. The Sidang Injil Borneo (SIB) church in Negeri Sembilan was the latest target of an attempted arson, which left its front wooden doors charred. This morning’s attack brings the total number of churches targeted since Friday to eight. Contacted later, Pastor Eddy Marsonyasir, 34, said he discovered the incident when he arrived at the church this morning. “A few church members and I left the church at 11.30pm last night but when I came in this morning, I found the wooden door destroyed,” he added. Accompanied by DAP’s Rasah MP Anthony Loke, the pastor later filed a report with the Seremban II police station. Loke told Malaysiakini that there was no evidence of molotov cocktails having been used. He also pointed out that the church sits only 1km away from the Seremban district police headquarters. “I strongly condemn the attack. This is part of a growing trend which is alarming. “We urge the police to take stern action to safeguard churches and other houses of worship,” he said. Founded in East Malaysia, the church is frequented by Sabah and Sarawakian students, with sermons conducted in Bahasa Malaysia. Meanwhile, Seremban district police chief Saiful Azly said that a chemical substance was used in the attack. “The fire and rescue services department is now trying the ascertain the kind of chemical that was used,” he added when contacted. According to Saiful, the incident most probably occurred between 1.30am and 8.30am. No arrests have been made so far. The attacks on churches followed the high court’s ruling on Dec 31 to allow a Catholic weekly, Herald, to use the word ‘Allah’ in its Malay-language edition. However, the court granted the Home Ministry a stay of execution pending appeal a week later after the attorney-general intervened, citing national interest. To defuse tension, the government announced today that it will hold inter-faith dialogues between various religious leaders to reach a common understanding. Both Barisan Nasional and Pakatan Rakyat politicians have condemned the attacks and appealed for calm.